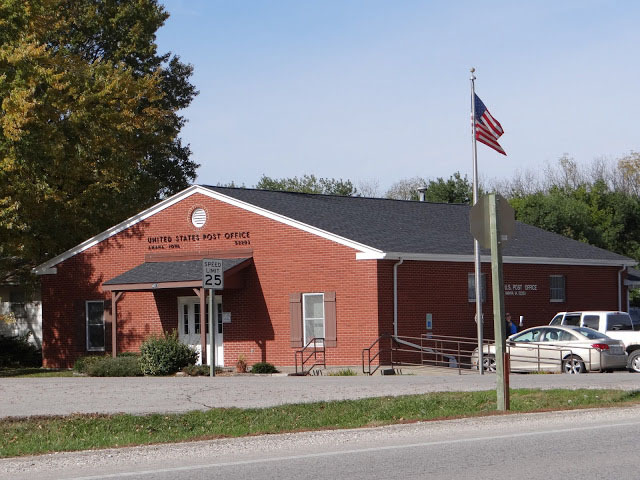 EditMay 12, 2013: The Middle [Amana] post office has since reopened. The below content will remain as written on May 5, 2013. The "lease dispute" strikes again, and according to KCRG-TV out of Cedar Rapids another small-town office bites USPS's emergency suspension dust. The victim this time: Middle, Iowa, also known as Middle Amana. If Amana sounds like the name on your refrigerator, that's because that now-Whirlpool subsidiary began manufacturing coolers in this very town in 1934. But the seven villages that comprise the Amana Colonies have a history that long predates electricity. 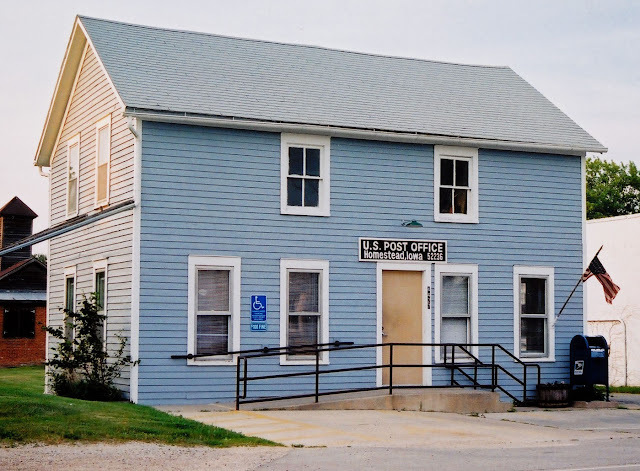 The villages were founded by immigrant members of the Community of True Inspiration religious sect, who fled Germany in search of religious freedom. These colonies were called by some "utopian experiments", and they were in fact communal, with "all property was held in common". (The Amana Heritage Society has further details.) The town of ["main"] Amana was settled in 1855, with the surrounding six villages established within eight years. The Amana Colonies are located in eastern Iowa, about halfway between Des Moines and the Quad Cities and a tad north. Cedar Rapids and Iowa city each lie about 25 miles away, to the northeast and ESE, respectively. 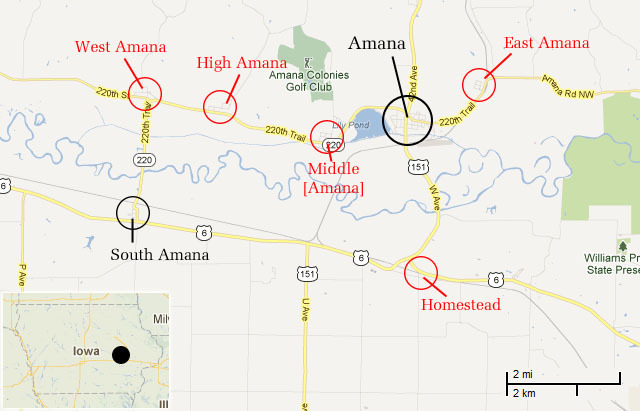 The seven villages are Amana, Middle [Amana], High Amana, West [Amana], South Amana, East Amana, and Homestead. 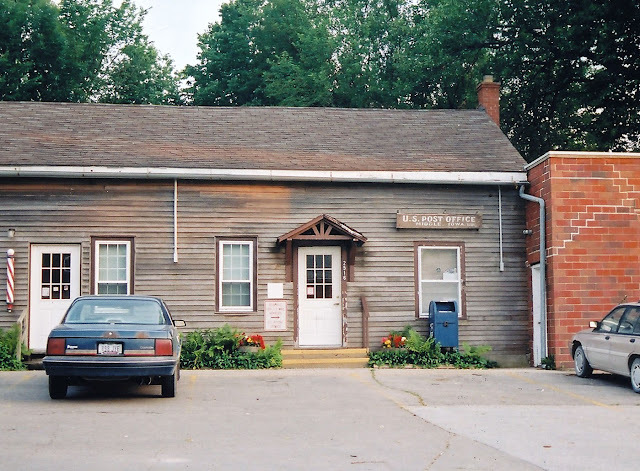 Of the seven towns in the Amana colonies, six (all but East Amana) have possessed a post office. With the suspension of the Middle post office, that leaves the colonies at two operating post offices: Amana and South Amana. Photos from 2012 are my own; prior photos come courtesy the Post Mark Collectors Club (PMCC) Museum post office photograph collection  in physical form, that is. 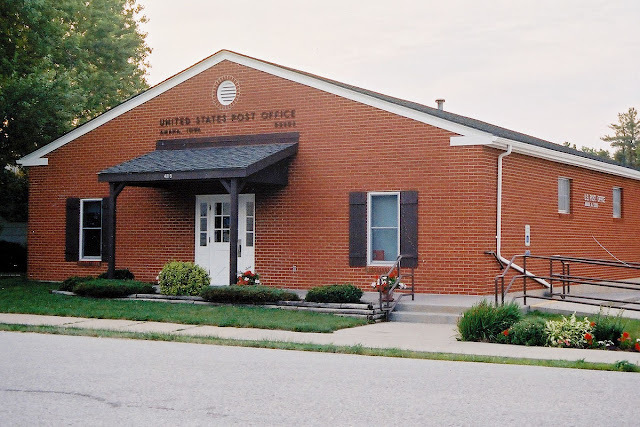 A post office has been operating in Middle since Jan. 14, 1933, and it has been at its present location for most of that time. 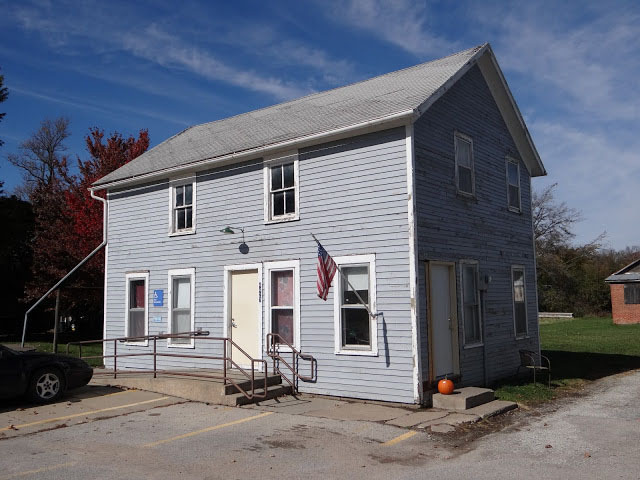 USPS's Leased Facilities Report sheds light on some of the history of the Middle Amana post office and the terms of its lease. The present site has been occupied since April 1948; the site was likely moved in tandem with Carl Hergert's being named Acting Postmaster that February. (Research shows that Mr. Hergert, a New Year's birthday boy, was 29 years old at the time he became Postmaster; he died in 2003 at the age of 84.) Maintenance is conducted by the landlord (the Amana Society), which cuts down on USPS's operating expenses at this location. The terms for the five-year lease ending April 30, 2013 provided for a 523-square foot site leased for $2,520 a year. Let's see what we're looking at! A comparison of the photos (including this one, at Iowa Backroads) suggests that a new sign was installed between 2003 and 2010. You can read more about a previous closure scare in 1995 at that link as well. Under USPS's POStPlan the operating costs at the Middle post office were slated to decrease anyway once POStPlan was implemented at the office by next summer; a minimum-wage Postmaster Relief would have been hired to operate the facility for four hours a day. Additional commentary is available at Save The Post Office, here. Next up in our Amana postal tour is the town of Homestead, the last town to join the Colonies, in 1861. 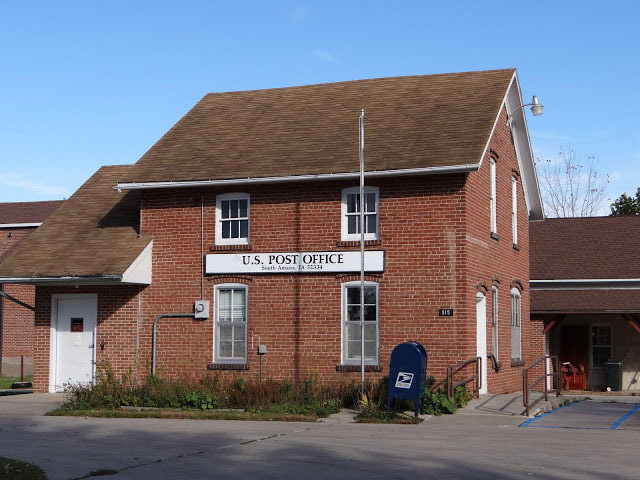 The post office predates even that development, having been established Aug. 16, 1852. The post office here, too, was suspended, Nov. 28, 2011. 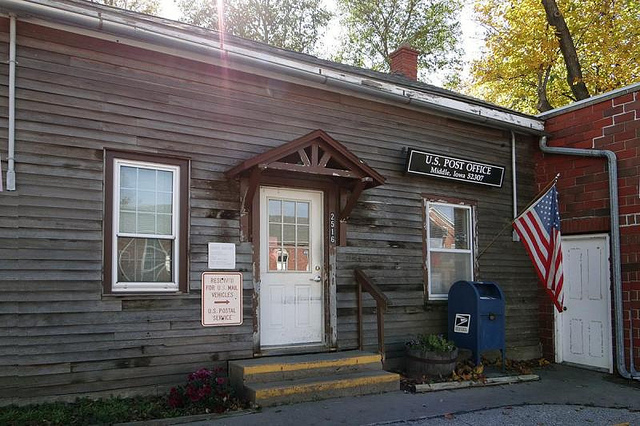 Until its suspension the post office was at the same site since 1913. Iowa Backroads discovered this photo, from the Amana Heritage Society Collection, showing the post office in 1919. Physically, IB notes, the building had changed in several ways: "a ramp has been added added, chimneys removed, and supports now prop up the west wall of the building." I came across the site in 2012, and though the sign had been removed the building was clearly the site of a former post office. A new sign has since been installed. Amana's post office, by far the biggest in the Colonies, was established Sept. 3, 1884 and is not slated to incur any cuts as part of POStPlan. 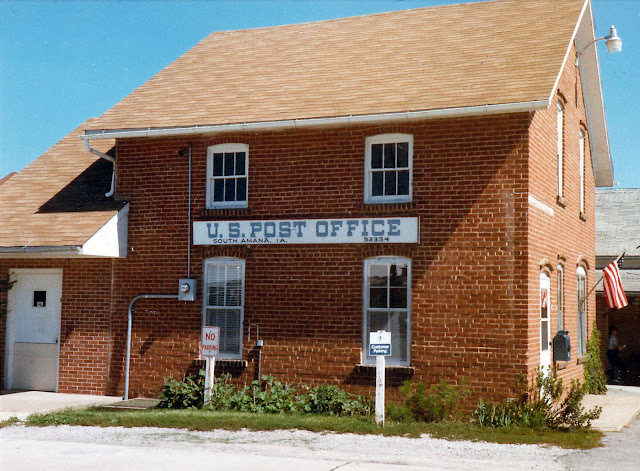 The post office has been at its present site since Feb. 1972. Its current lease, also with the Amana Society, costs the Postal Service $14,400 per year and lasts until 2016. A comparison with a more recent photo reveals substantial landscaping changes at the building's front entrance. 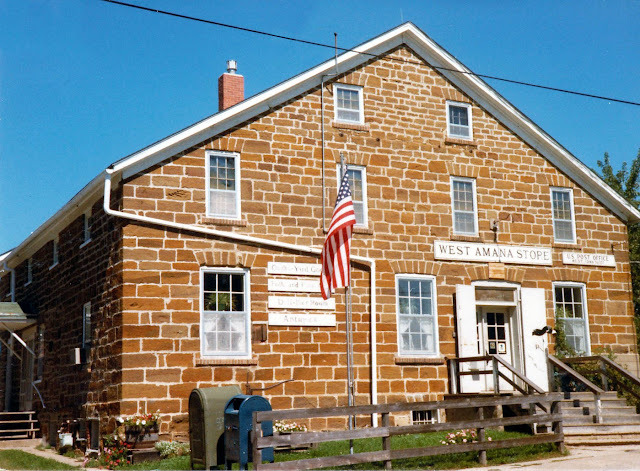 The post office in West [Amana] was established Feb. 28, 1902 and was discontinued March 1991. The post office in High [Amana] was established Apr. 6, 1901 and was discontinued Feb. 29, 1968. We do not have a photograph of this operation available. Not much detail, but two weeks later, Middle has reopened! Thank you; a note has been appended to the beginning of the story reflecting this announcement.